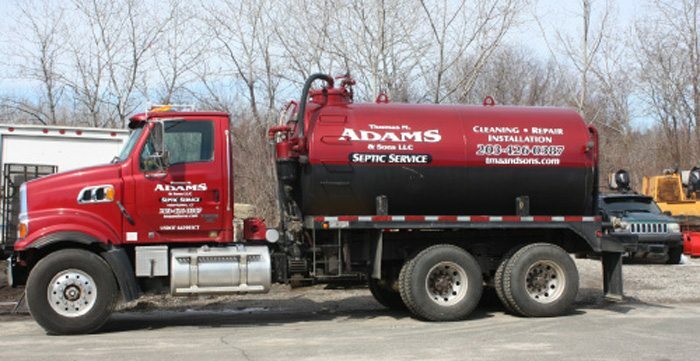 Finding a company that can do a good job cleaning your septic tank is an essential part of any septic system, and here in Newtown, CT, one of the best companies in the industry is Thomas M Adams and Sons. We have been completing septic system cleanings for years, and no matter if you are a business or residential client, the simple fact of the matter is a proper cleaning will help your system. Cleaning a septic system is something that has to happen, and the reason for this is simple. A septic system is a living machine, that needs help from time to time to ensure that it can do its job properly. With a septic cleaning, you are allowing the microorganisms to do their job, and allow your entire system to function better. We want to work with you to ensure your system is in tip-top shape for the entirety of its life, and part of that is cleaning the system every 2.5 years. It is a bit of a big job, but when done at the right intervals, a cleaning will extend your systems life by years, and that is never a bad thing. With our cleaning services, we look to ensure all the plugs, screws and systems are working properly, and handle any solid waste that may have gotten into the system is removed safely. We will also inspect the entire system for any potential issues, and will help answer any questions you have about your system while on site. It is all about the price with this kind of service, and here at Thomas M Adams and Sons, we believe that we have one of the best pricing schemes in the state. No matter if you are in Monroe, CT or Sandy Hook, CT we offer a competitive pricing that starts at $250 on the ValPak. Naturally, we adjust as needed for your tank, but our work pays for itself in the long term, and that is something our clients have loved. Call our team today, and see why so many have used Thomas M Adams and Sons for their cleaning services right here in the heart of Connecticut!